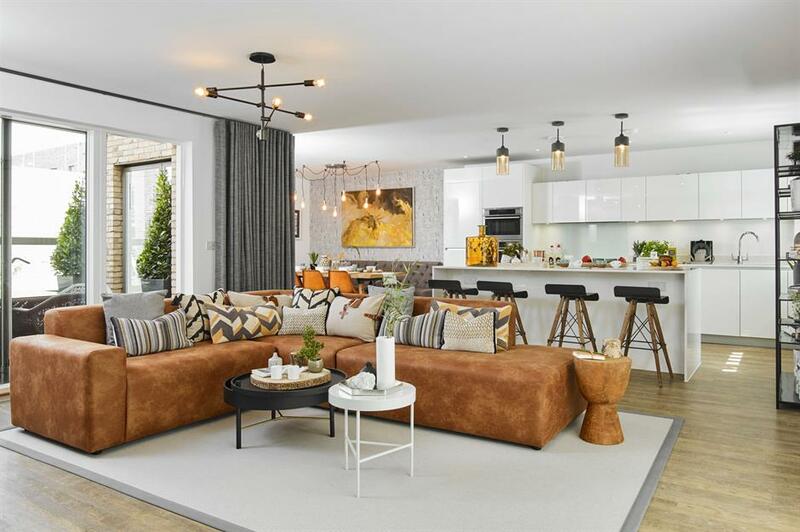 Practical, accessible and spacious, an open-plan layout has so many benefits for modern living but you will need inspiration and tight planning to really pull it off. Zoning is the key to transforming a large empty room into a multi-tasking space that acts as a living room, kitchen and dining room. 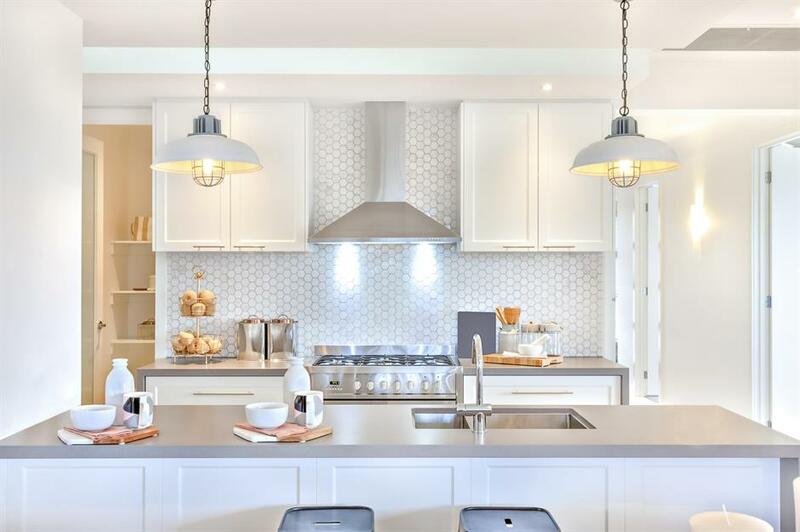 So before you knock down those walls take a look at these design tricks to help you tailor the space for a perfect fit. Strong wall colour makes a striking feature and creates a clear visual link between adjacent living areas. 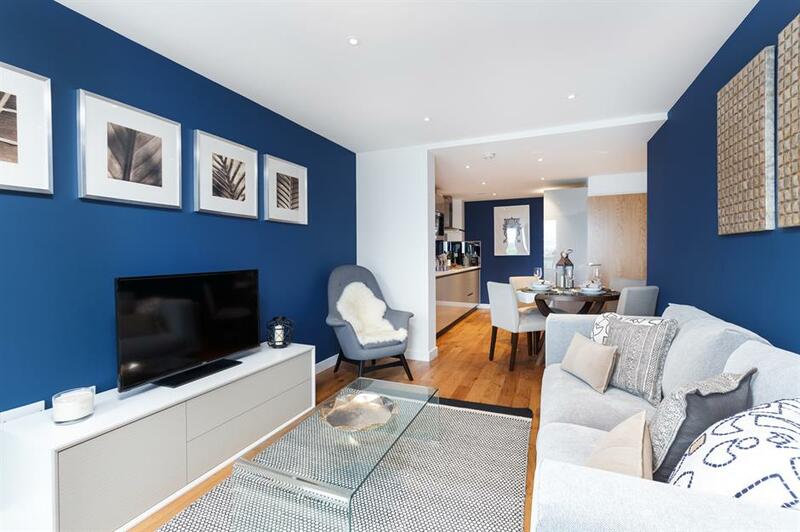 Painting the walls opposite each other elongates this small space but be sure to balance the rich tone with a neutral, like crisp brilliant white, to keep the whole open-plan room light and airy. Need advice? Here's how to easily add colour to your home. 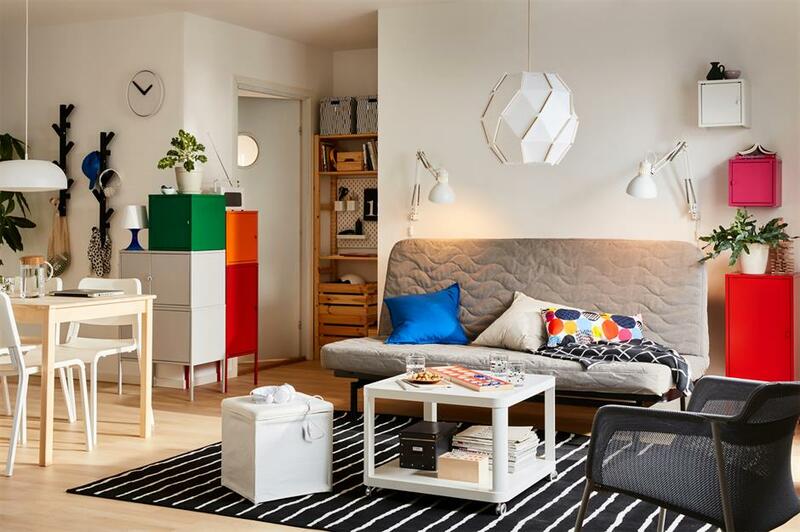 This amazing scheme proves you can go for pattern in a small space. This clever optical illusion wallpaper appears 3D, adding depth to a broken plan space. It also encloses the living area and make it feel cosy and private. 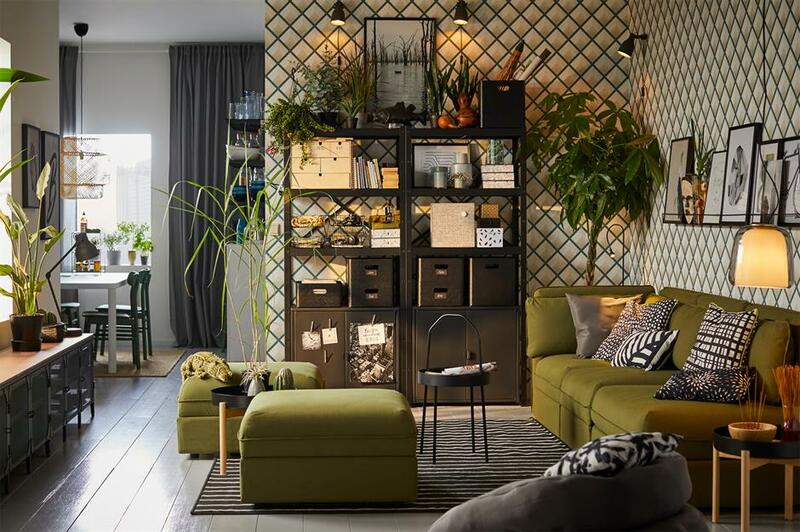 A tall shelving unit can serve the same purpose if you have no walls at all to play with – fill the voids with plants to create a DIY living wall effect. 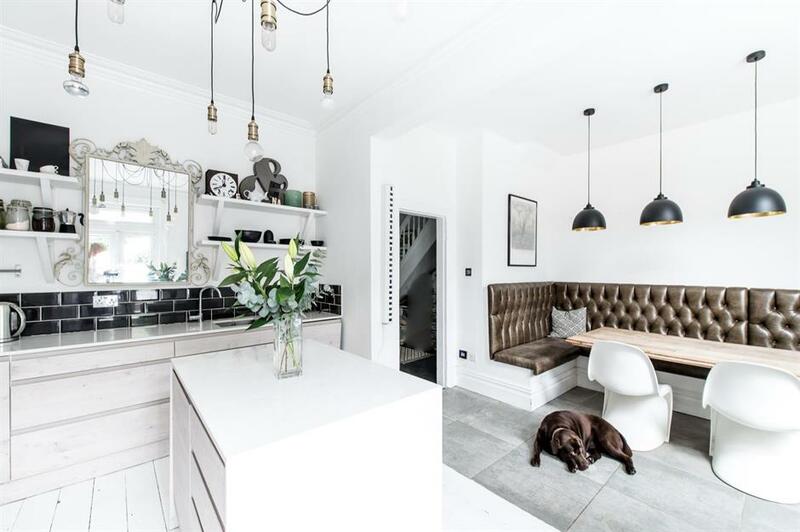 Low ceilings and exposed brick walls would have made this traditional building feel cramped and chaotic but now they are striking and attractive character features to this large and airy open-plan cottage. Knocking out walls in older buildings can give a house that was once full of small and poky rooms a new lease of life. An architect will have more ideas about possible layouts, so get expert advice before you start. 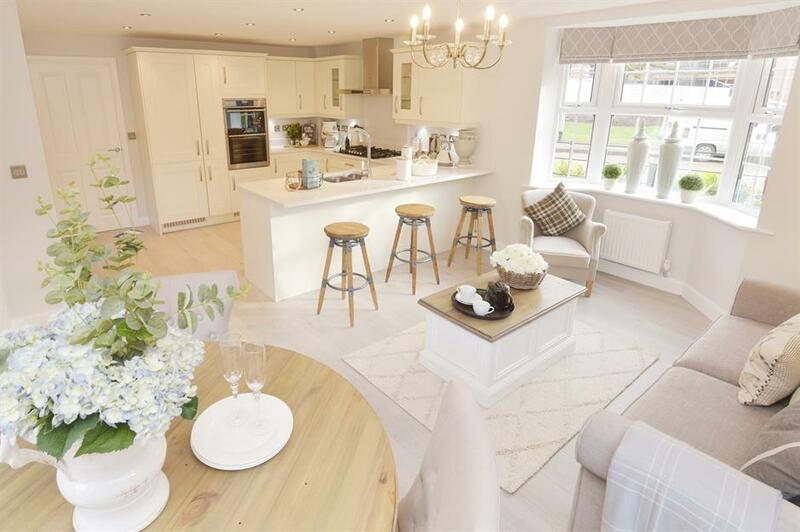 When planning your open-plan space think about creating a scheme that complements your lifestyle. This plain rectangular room has been transformed into an inviting home bursting with character. There should be plenty of room for a large sofa maybe even two positioned socially. 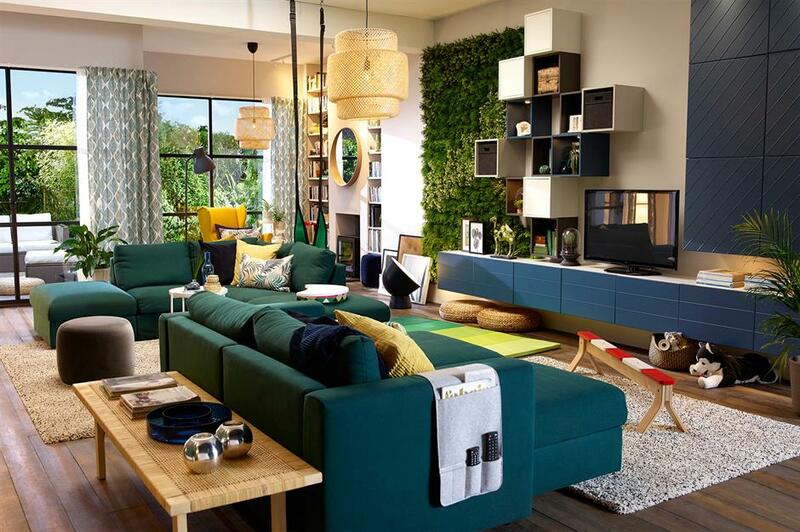 Wall hung storage will keep a busy space organised and quirky additions like the living wall and ceiling swing add a lively personality. 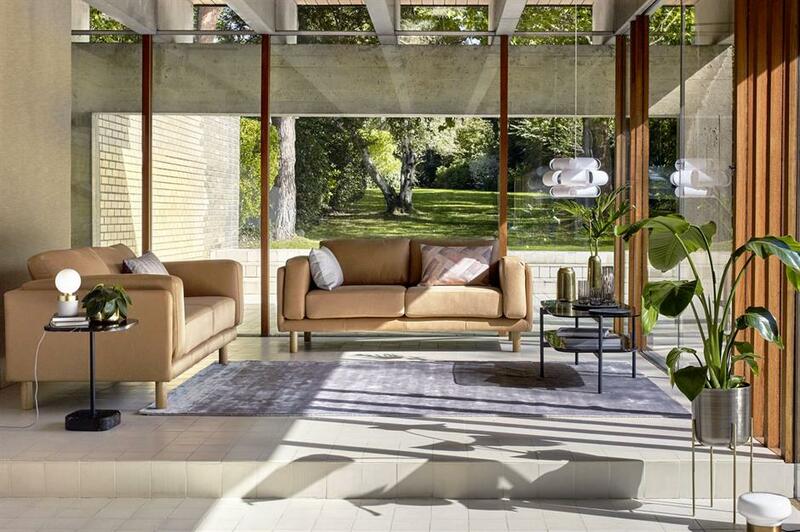 Even modern open-plan layouts can get a stagnant formula. Give your design a refreshing twist by moving zones from common positions. 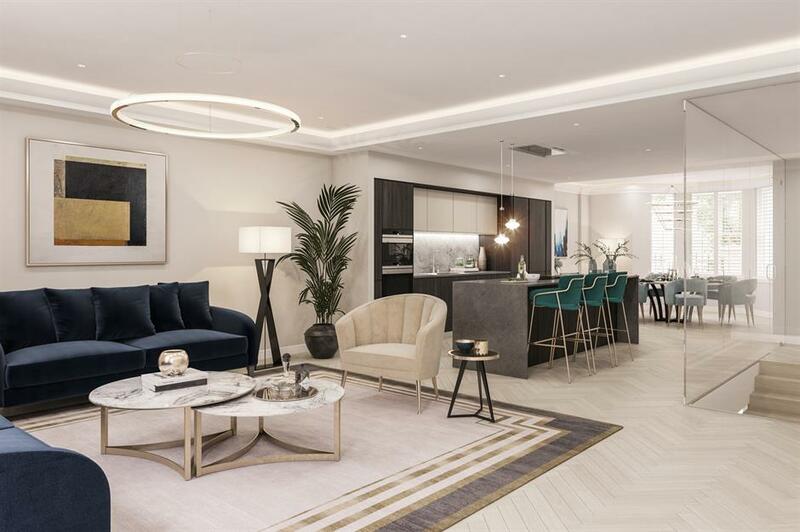 Placing the contemporary galley kitchen in the centre of this modern apartment gives it a luxurious quality and purposely separates the living and dining zones making each seem more private. A home without walls means you may have to factor in multipurpose spaces. 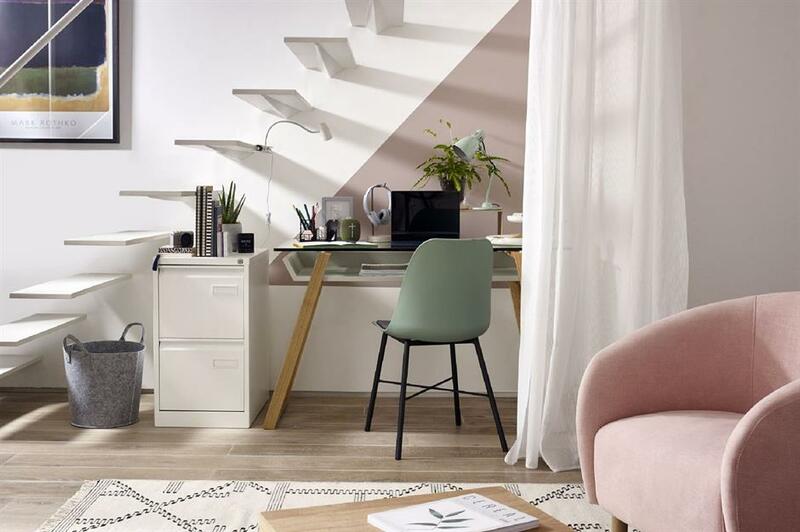 Make a home office part of the scheme with a matching desk. Don't neglect smart storage either, as it'll be on display all the time. If privacy is an issue there close it off with a curtain or freestanding screen. Need inspo? Here are 58 home office ideas that don't scrimp on style. A large open space needs layers of texture to be transformed from a stark, cold room into a welcoming and relaxed home. 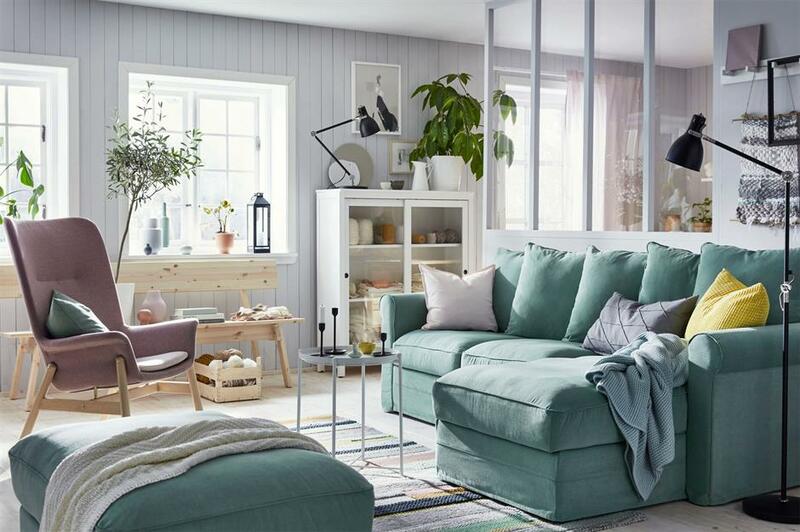 Calm colours will make the most of the light and bright environment while a soft sofa with plenty of cushions and a large long-pile rug will warm the open-plan space with cosy character. 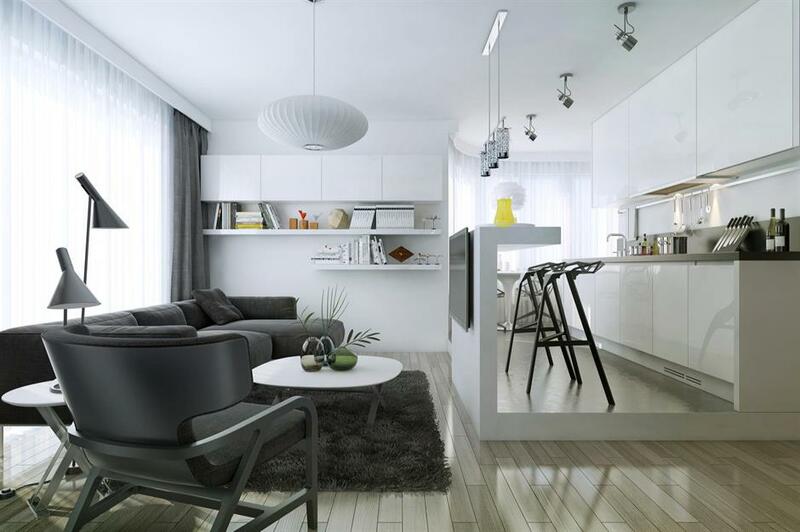 An open-plan room can become a busy space with lots of traffic. Keep floors and walkthroughs clear by choosing slimline side-boards and fixing the TV onto the wall. As audiovisual technology moves on, television sets are getting thinner and lighter so they are much easier to mount. In fact, it's safer to secure them to a wall, particularly if you have young children around. Smaller open-plan rooms will benefit from a space-saving round dining table. The curved edges will act to turn the petite kitchen into a mini kitchen-diner and will give the whole space a softer look. Alternatively, place it to the side of the room to allow plenty of passage for through traffic. 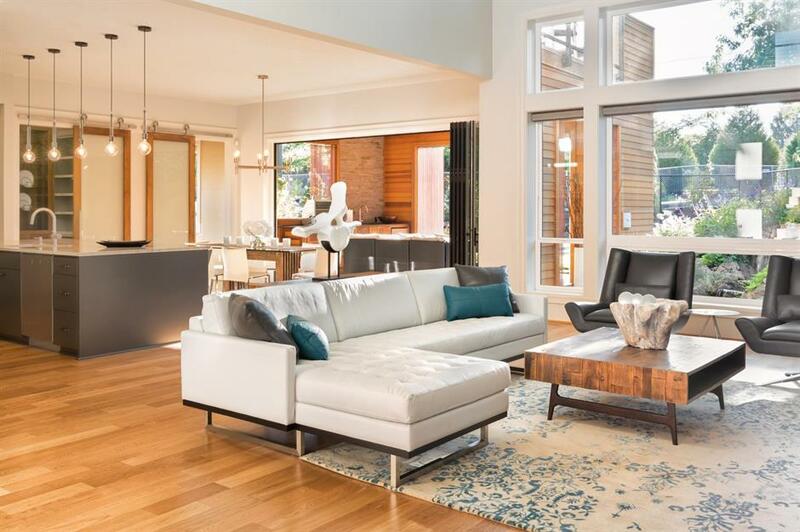 Consistency will make your open-plan home look streamlined and elegant. 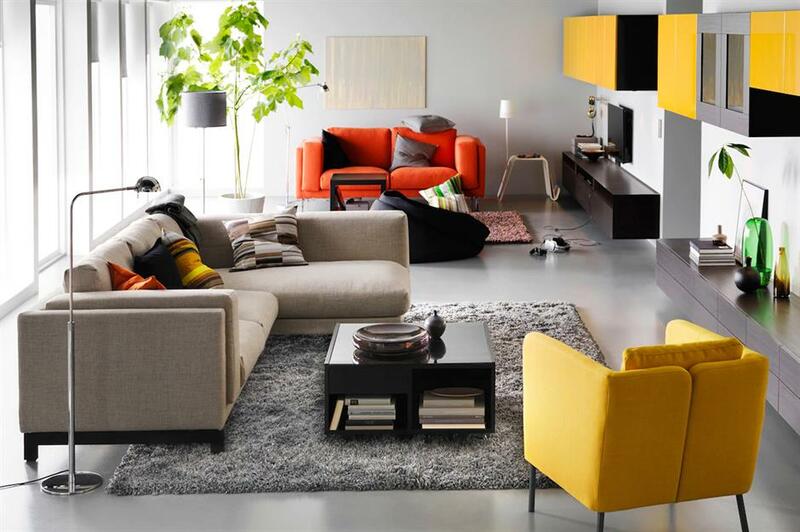 Create a visual link between spaces by choosing matching furniture. Here, pale neutral walls allow black fixtures and accessories to become the main feature, seamlessly blending one zone into another. A well-designed open-plan space should feel inviting and relaxing. One way to achieve this is to offer a variety of seating areas for both dining and chilling out – there are lots of brilliant ways to squeeze in an eating space. You could create a breakfast bar from an island or peninsular unit, or add a small-scale dining table if there is room. You may also want to add a feature armchair opposite a comfy sofa to create a social space perfect for lounging. 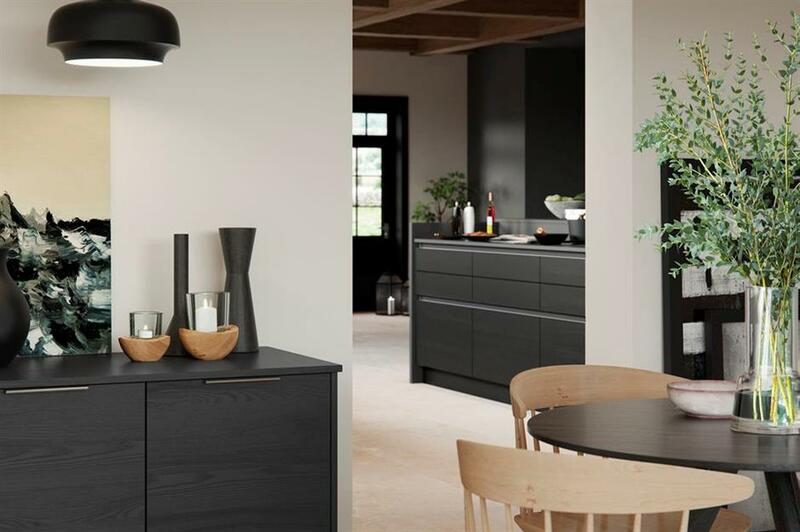 To give a room an instant shape and structure use freestanding furniture to differentiate the areas. 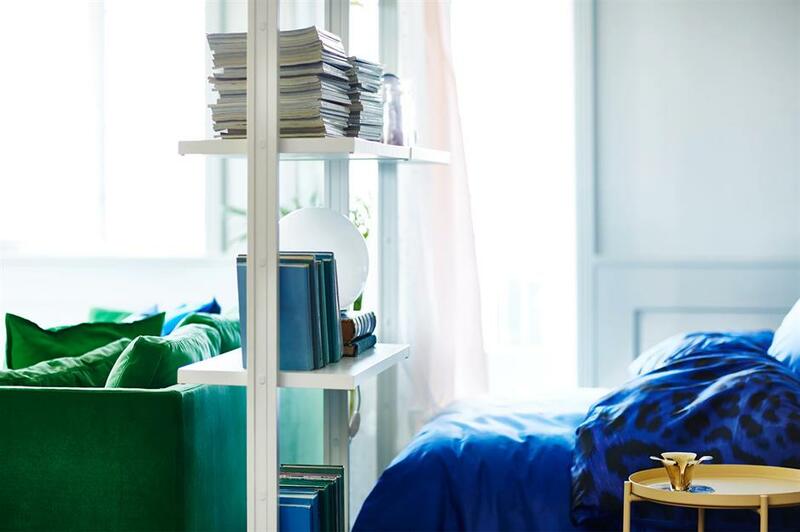 Even a simple shelving unit placed between a bed and a sofa divides the space into living and sleeping areas, and gives you practical extra storage. People often try to separate the stairs from their living space by leaving them walled off in a separate hallway, but stairways can be striking architectural features in themselves. If the room is dark, they can also bring valuable light in from above. Go for a staircase with open risers or even one that is made from glass to increase the amount of natural light flowing in but do check with your builder if it requires additional fire safety measures. 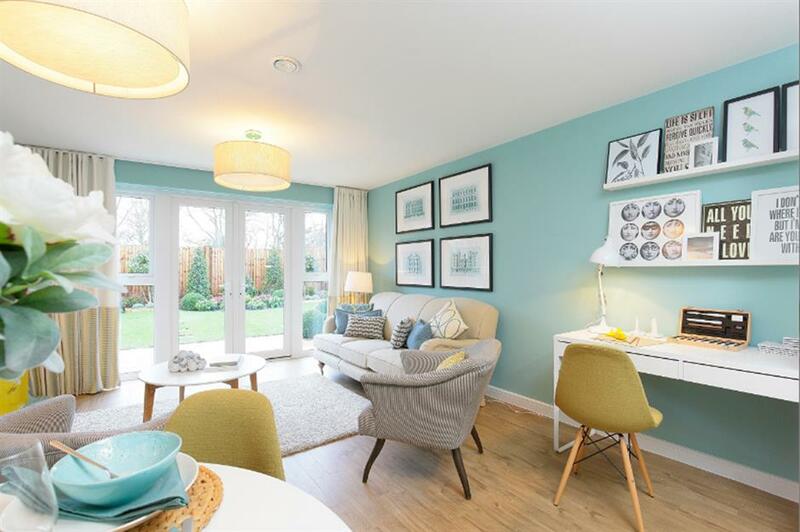 To make a compact open-plan space feel as large as possible keep the walls a white or neutral shade and use the same wallpaper or paint throughout. 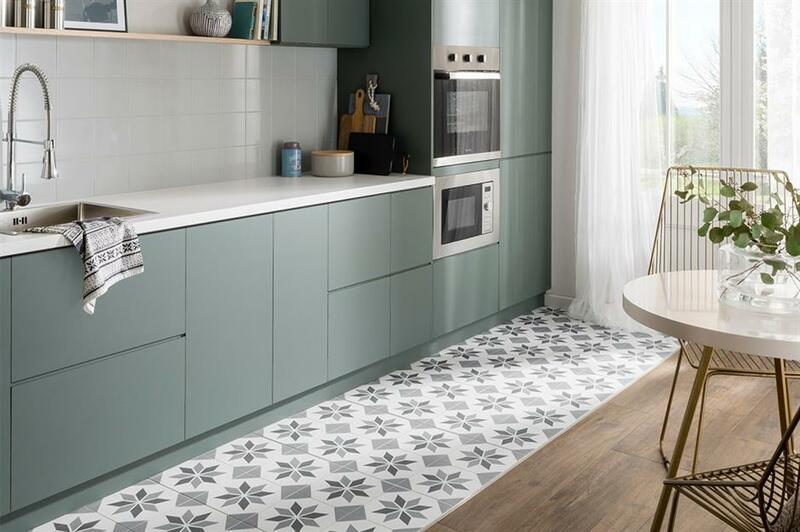 For very tiny spaces stick to the same flooring too, as a mix of colours and patterns will break up a petite area into small sections, making it feel cluttered. To maximise the light and allow the space to flow seamlessly into the garden in the summer months, install large glazed floor-to-ceiling panel, bi-folding or crittal style doors. When opened up onto the patio, your outdoor seating area feels like a natural extension of your kitchen and living space. When your kitchen is part of a larger living space it gets seen by everyone who visits. 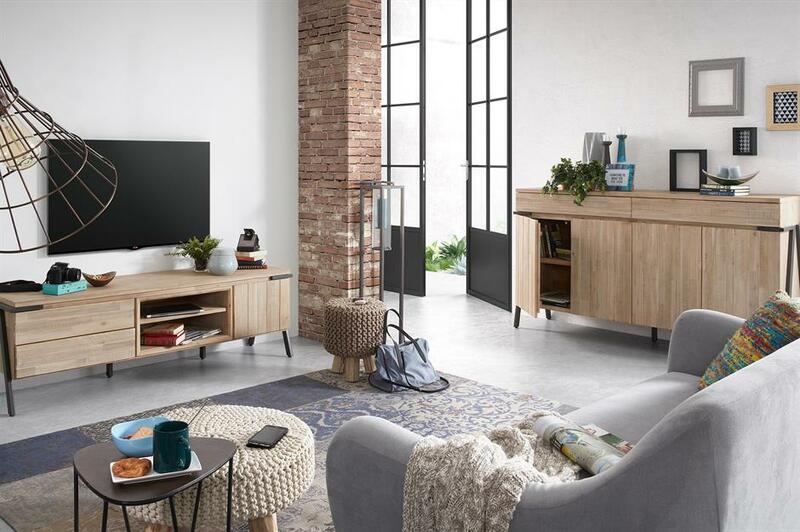 It's not ideal if guests can see your socks spinning around in your washing machine or drier, and you don't want your white goods to make such a din that you can't hear the TV, either. Go for integrated machines that can be hidden behind kitchen units and buy the quietest possible models. Integrated fridges, freezers and dishwashers will also make your kitchen look sleeker. A larger open-plan space allows you to be more creative with your flooring options. It is possible to mix and match different types of flooring in a single room to help separate the spaces, as long as the flooring types compliment and flow into each other. 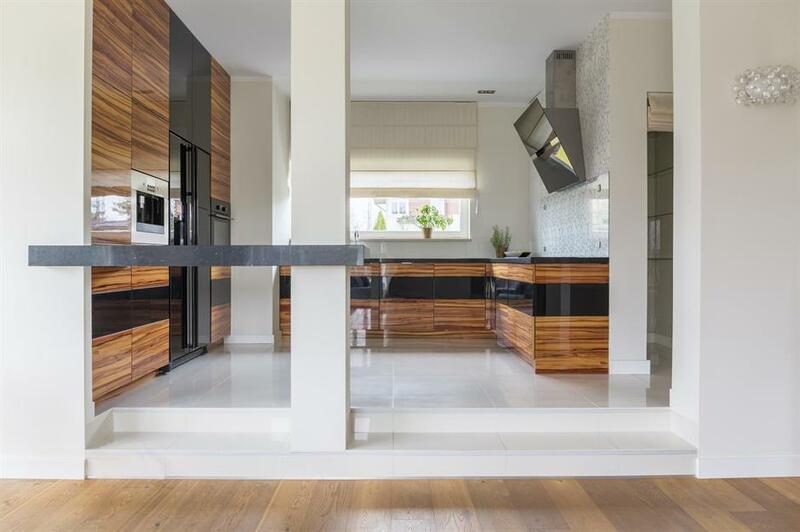 Here porcelain tiles have been used in the kitchen area while the wood-effect tiles define the eating space. A peninsular unit that juts out at right angles from a wall of units can help you to create a natural barrier between your kitchen and the rest of the space. 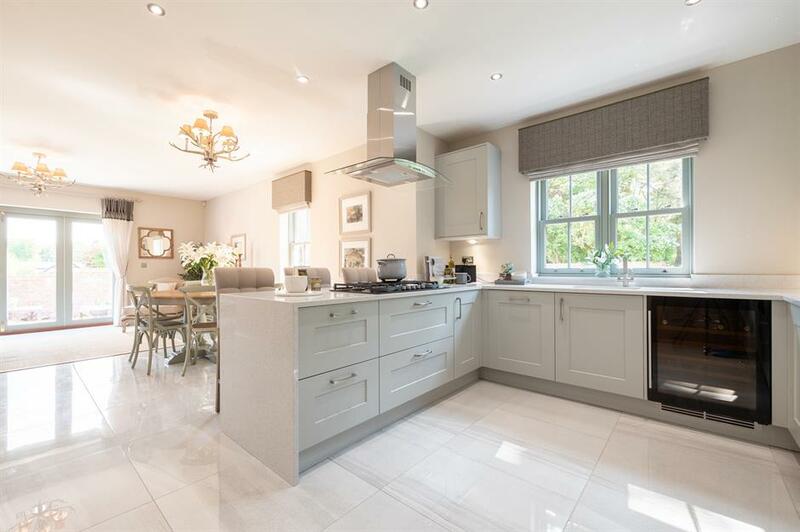 It can also provide useful additional worktop and storage space for the kitchen and the reverse side of it can double up as a breakfast bar area with further storage beneath. If your open-plan space is long and narrow with windows at either end, chances are the area in the middle is starved of light. If you're extending to create your new room, think about installing a glazed roof or build an impressive orangery-style extension to get light flowing throughout. Install electronically operated blinds on those roof light wells too, so when you do want it feeling dark and cosy at night it's easy to shut out the outside world. If you're extending to create your open-plan space think about varying the ceiling heights to help to define the different zones in the room. 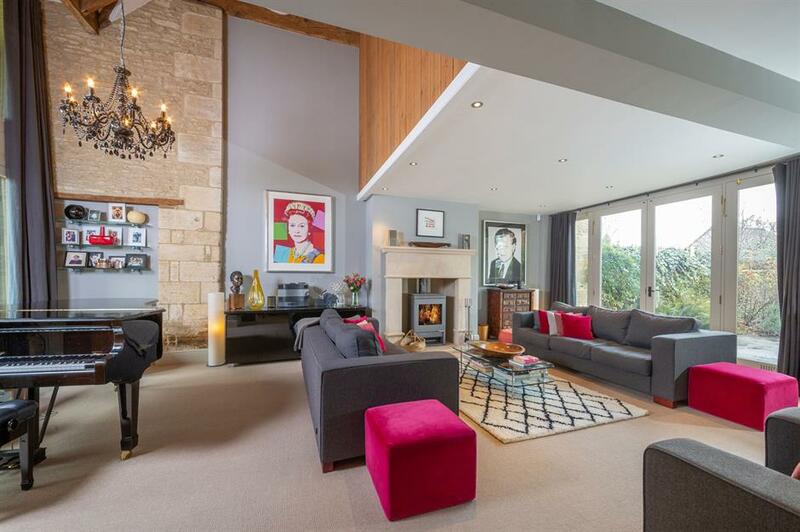 Here the living area sits under a lower-level ceiling, this helps to make the seating area cosy, especially with the log burning stove here too. A large chandelier draws the eye out to the impressive double-height ceiling and a piano makes good use of the open acoustics. If you have particularly high ceilings or are extending a building from scratch think about incorporating a mezzanine floor into your design. It will allow you to create a more private area within your open-plan space. This can be used for additional seating or as a library, as shown here. 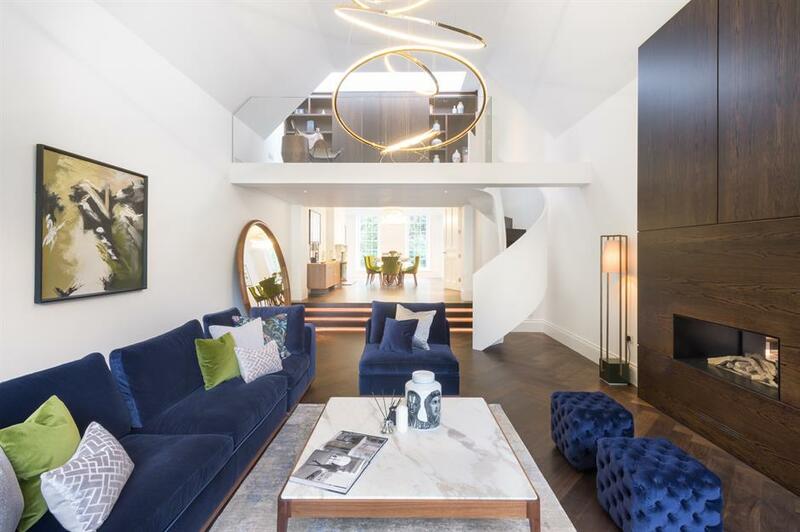 The impressive staircase forms a sculptural piece of art and focal point between levels. Curtains can be used to create temporary walls and are very easy to install. Add a curtain track to the area of the room you'd like to screen off and hang made-to-measure curtains or voiles to get the right floor-to-ceiling length. If they're in the middle of the room they should be double-sided so they look good from both sides. Curtains can also be a great value way to hide an area like a home office as shown here. The great thing about an open-plan space is that it can be easily rearranged to set a whole new scene as and when you need. If you want your room to be easily cleared or moved around for a party, make sure the bulk of your furniture is on wheels. This coffee table, for example, can be wheeled against the wall within seconds. It's also possible to get sofas, dining tables, bookshelves and even island units that are on castors. Think about how you're going to light your space right from the start, in order to plan for the electrical wiring and sockets required. 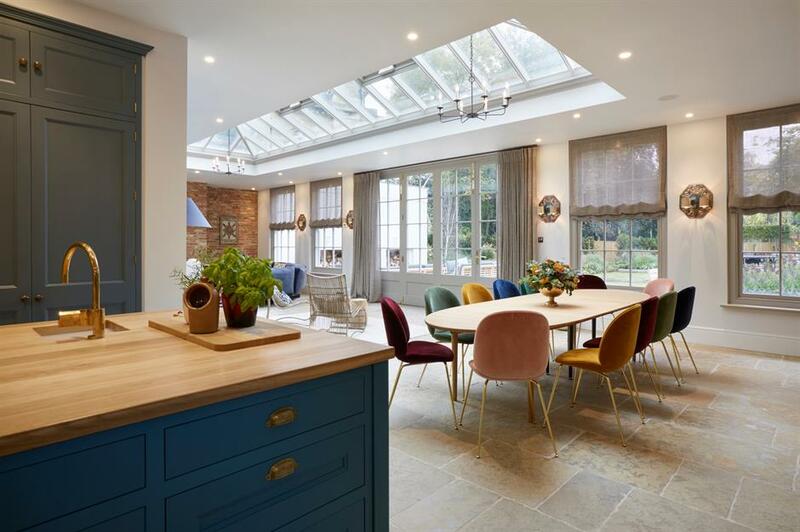 Options include a pendant to throw a pool of light over the dining table, a cluster of pendant lights over an island unit, as shown here, downlighters over the worktops and brighter spots that can be dimmed in your main lounge area. Creating split-levels in the flooring of your open-plan space will help you to discreetly zone different areas too. Here, a small step takes you up to the light-filled living area. A step down could be used to create a cosy snug in the corner of an open-plan space too. 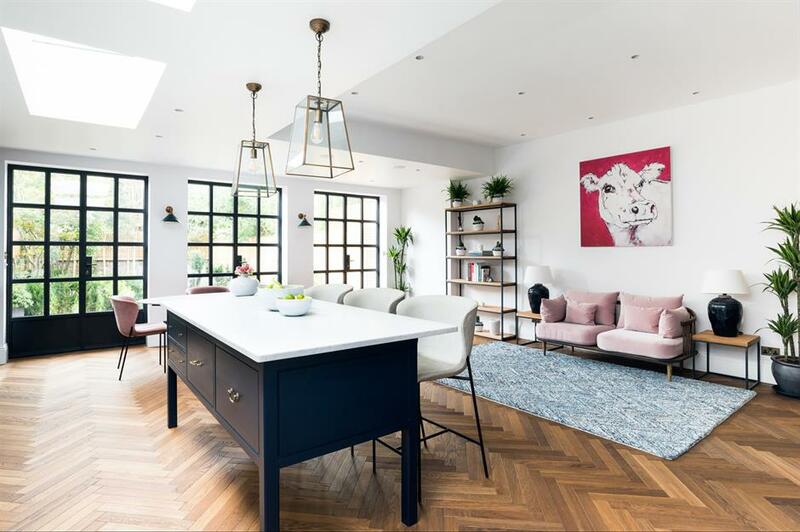 The beauty of an open-plan living area is that it allows you to watch over young children playing and older kids doing homework or chilling out while you get on with other tasks or relax yourselves. You may be able to squeeze in a playmat, study desk or even a games zone. You don't want the space to be taken over by toys and tech though, so invest in boxes or baskets where everything can be hidden away when not in use. 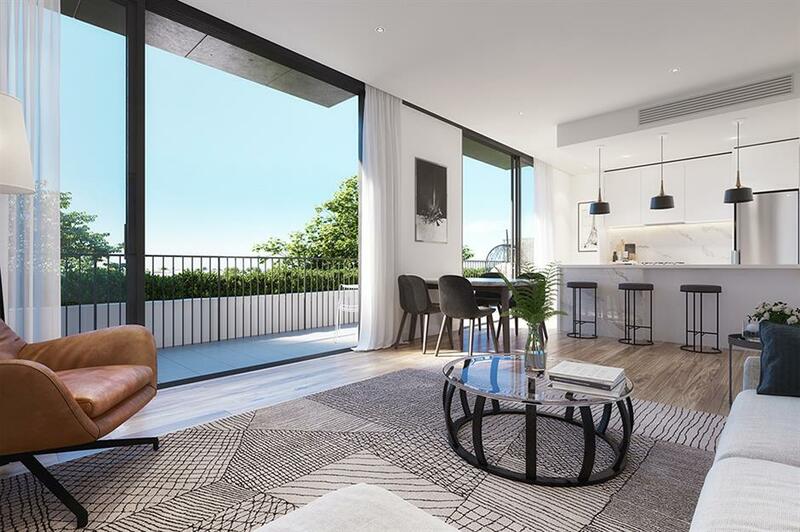 Sliding glass doors or panels are a very effective way of dividing up an open-plan space into smaller rooms when required without reducing the amount of light flowing through the entire area. Here, a dividing wall has been half glazed with panels to separate the living area from the kitchen diner in a way that doesn't block either of them off. 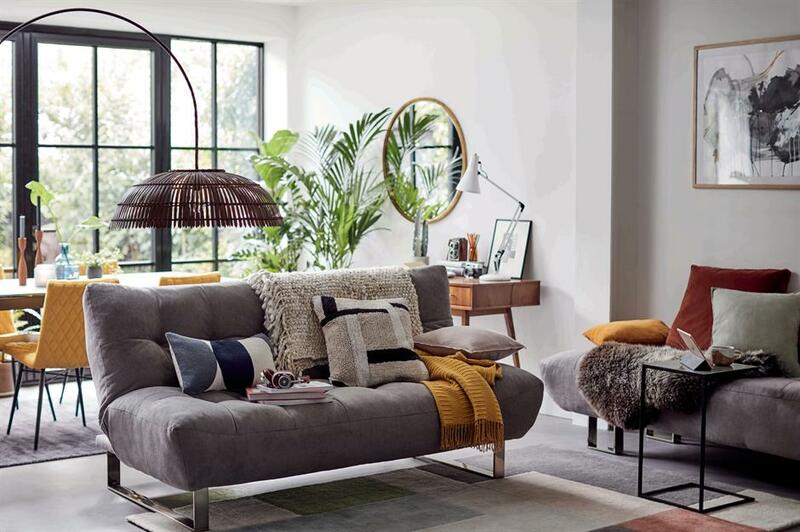 To ensure your living area feels like the cosiest part of the room, dress your sofa and armchairs with lots of plump cushions and have a throw draped over an arm for those chilly evenings. If your room is neutral opt for shades of the same colours in different textures. Or if there's a brighter backdrop you can be bolder and choose cushions full of colour and pattern. Our living room ideas gallery should give you plenty of inspiration to find a look you'll love. 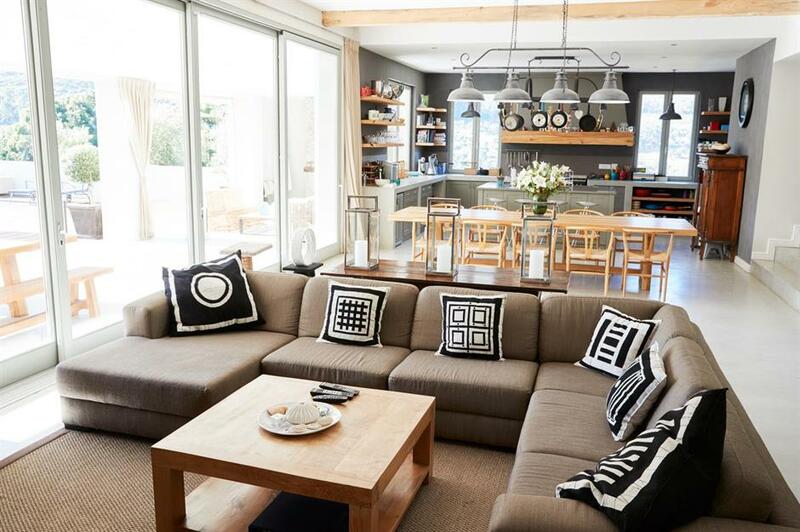 Without careful styling, an open-plan space is in danger of feeling cold. To avoid this subtly zone each portion of the room so you create intimate spaces within the larger area. A breakfast bar, for example, can separate the kitchen, pendant lighting over the table will define the dining area and seating as shown here, is gently anchored by a soft rug. 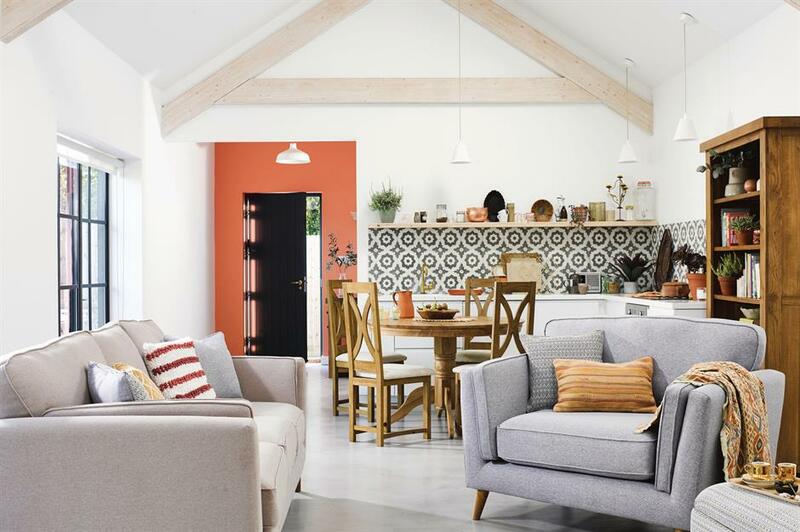 If you're extending your home or knocking down or repositioning walls to create a whole new open-plan space, think about making it L-shaped. It's easier to break a room up if it isn't a standard square or rectangle shape. An L-shaped room will allow you to create a hidden eating or sitting space in a corner, which will automatically feel cosier and more intimate. In a studio flat or small open-plan space, a half-wall can work well to screen off the kitchen from the rest of the space without blocking any light. A neat little breakfast bar has been made from one side of this wall, while the other side supports the TV, which faces out on to a cosy living area. Try to give each distinct area of your room its own focal point. In the kitchen, it could be the island unit or the range cooker. In the dining space it might be a dramatic pendant light. 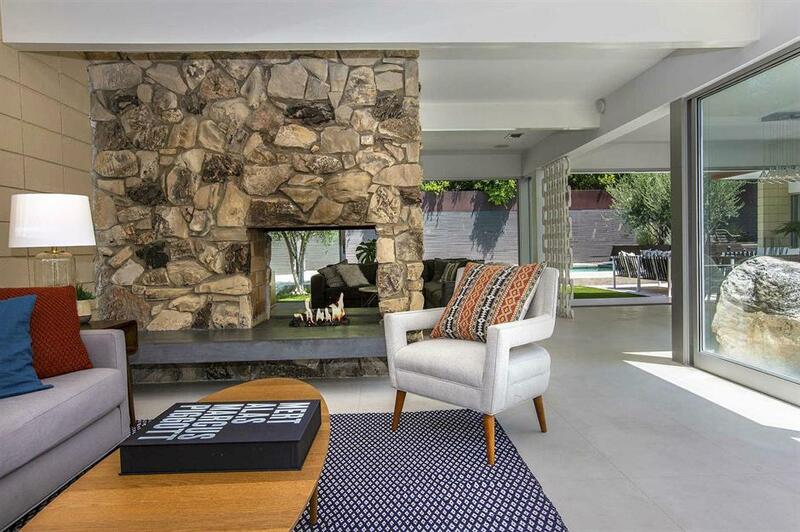 In the living area, a fireplace is ideal. Here, a fireplace has been built into a small partition wall between the dining and living space. And, if you thought you needed a chimney for a fireplace, think again: the latest bio-ethanol fires don't require a flue and can be placed anywhere. 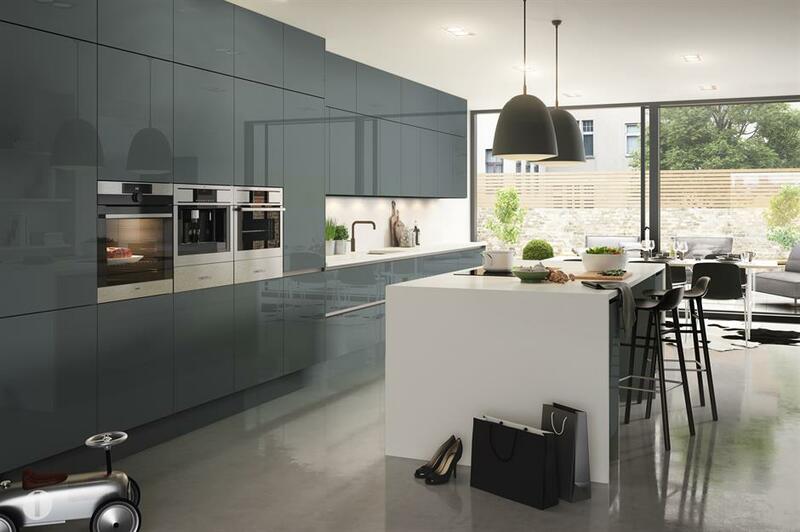 If you're looking to create a sleek open-plan space make the kitchen area as unobtrusive as possible with clever design and coherent finishes. Here, the kitchen units run only along the back wall and are raised quite high off the floor. 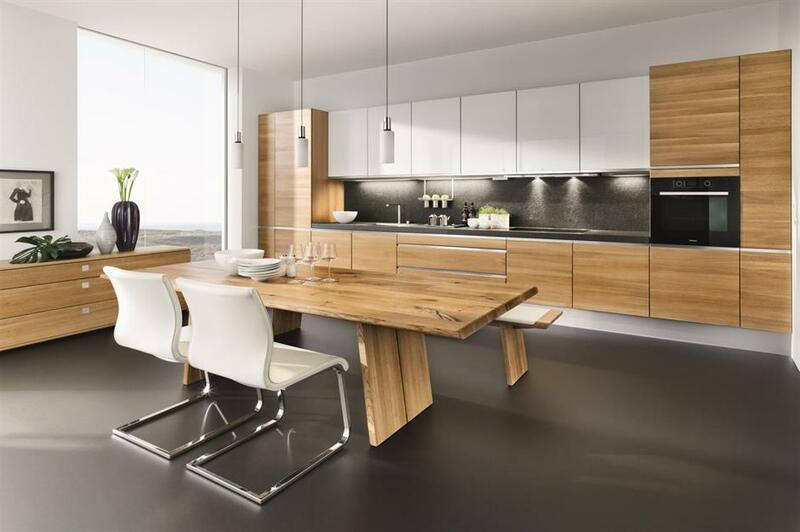 The unit fronts are simple, contemporary in style and handleless. 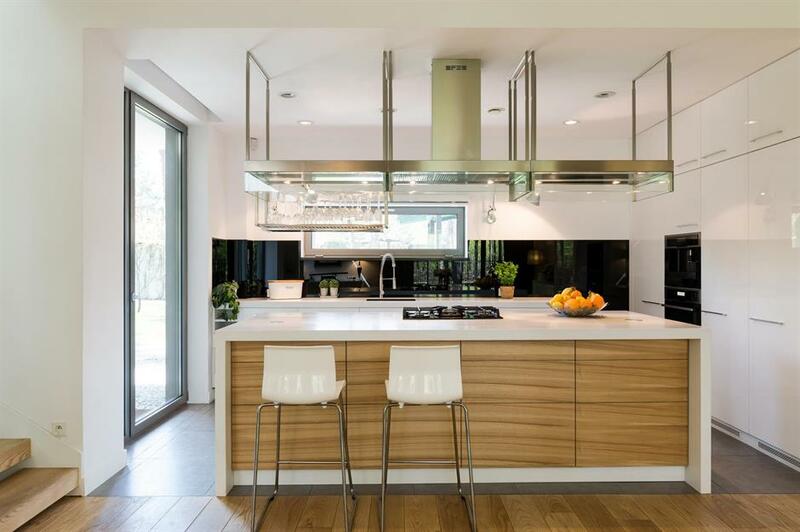 When not in use this kitchen has the air of a smart sideboard at the edge of the dining space. 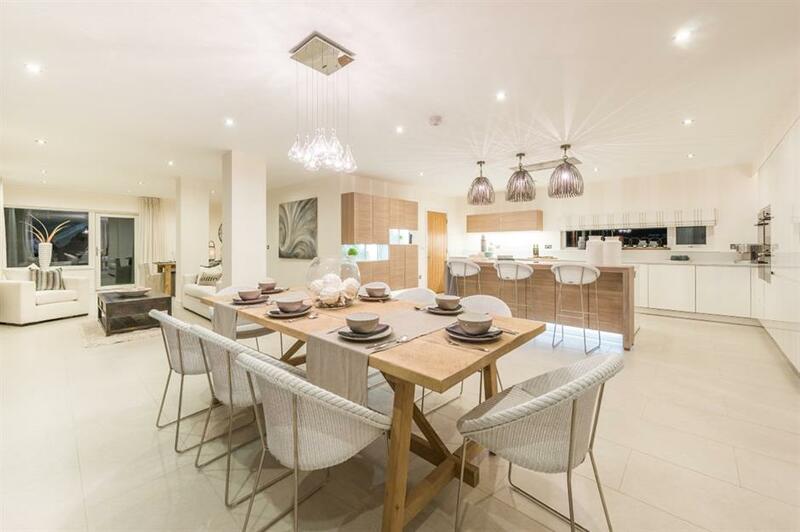 It's wonderful to be able to cook and entertain simultaneously and an open-plan space allows you to do that with ease. What you don't want though is for the whole room to smell of cooking, so it's important to equip your kitchen with a high-powered extractor to whisk all those odours away. 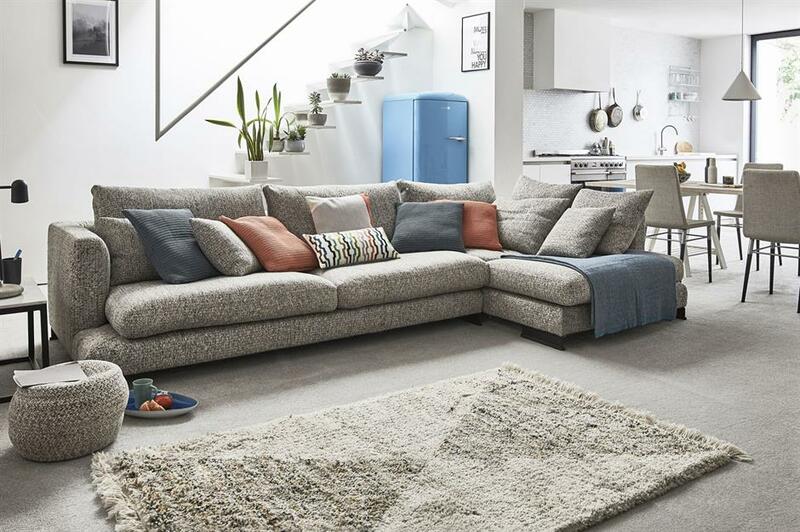 Keeping an open-plan space tidy can be a challenge - especially if you have a family. The easiest way to keep it always looking neat is to have a place for everything, incorporating nifty space-saving devices where possible. This means investing in a mix of hidden storage and display areas for those more attractive items. Here, the kitchen units, interjected with open-shelving, have been taken right up to the ceiling line so there is no redundant space. If you have the same flooring throughout, rugs are a cheap and easy way to help zone your areas. As a guide, the rug should be no wider or narrower than the furniture that's placed on it. Always make sure there is a small border of flooring visible at the edges, which will create the illusion of more space too. 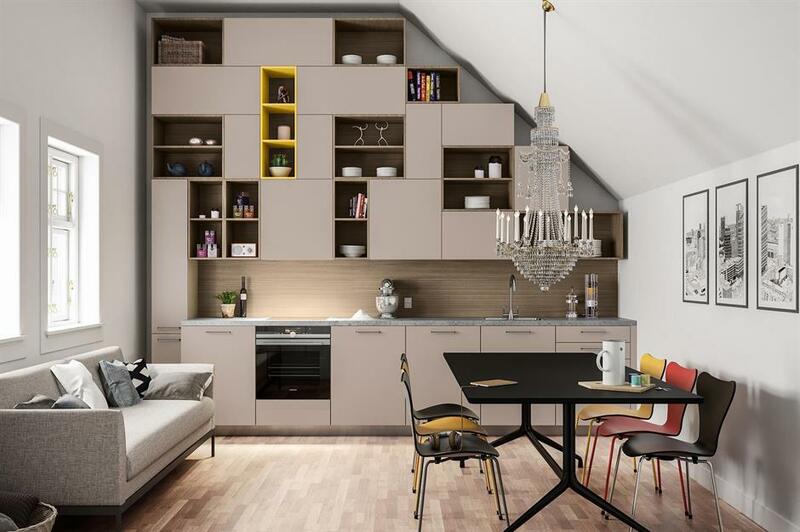 Using the ceiling to suspend items can be a very effective way of dividing up your space. Here the ceiling over the island unit holds the extractor fan and a striking glass display storage unit. Pan racks fixed to the ceiling would work in a similar way. But it's a trick that's most effective when used in rooms with high ceilings, otherwise it can crowd a space. When you create an open-plan space you often have to knock down walls or extend, which can leave you with awkward pillars supporting the ceiling. Don't let these structural features ruin your scheme, however, let them enhance it by incorporating them into your design. Here the pillar has been turned into a striking architectural feature by running a bar across it. 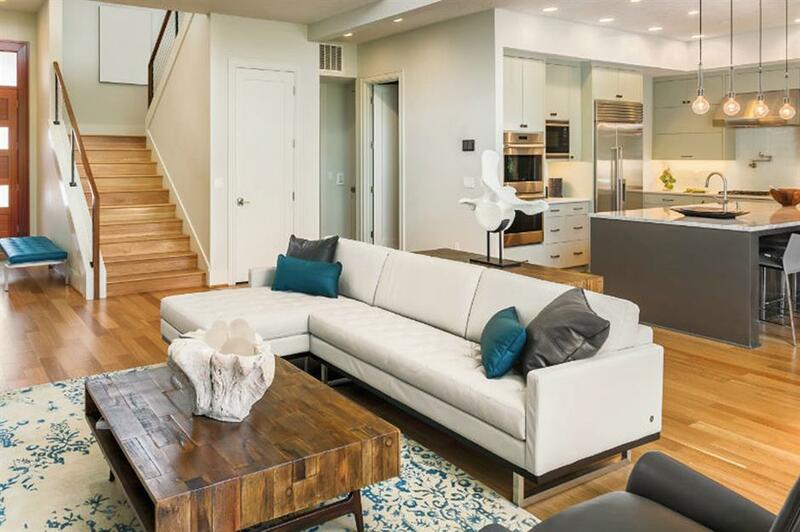 Define the living area with a large corner or L-shaped sofa. 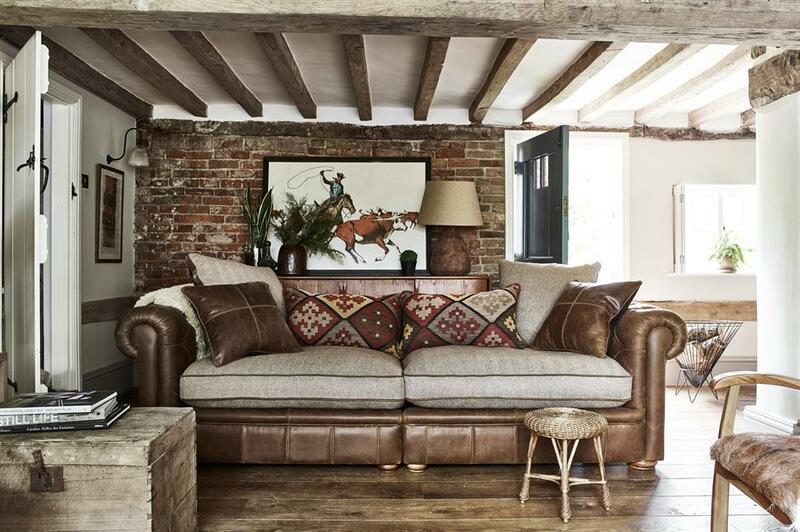 A tactile fabric like leather is practical and warming and will give the open-plan room a cosy feel. The rich tone will become an inviting focal point; complete the friendly and relaxed vibe with a rug coffee table and plenty of soft cushions. Still hungry for more? You HAVE to see this shapeshifting furniture.